Anti-abortion protests rise in UK Jump to media player The number of protests by anti-abortion campaigners in the UK appears to be on the rise. NI abortion law challenge under way Jump to media player A legal challenge to Northern Ireland's abortion law is under way at the High Court in Belfast. 'I chose to have an abortion' Jump to media player The BBC speaks to two women who feel strongly about abortion - on either side of the issue. 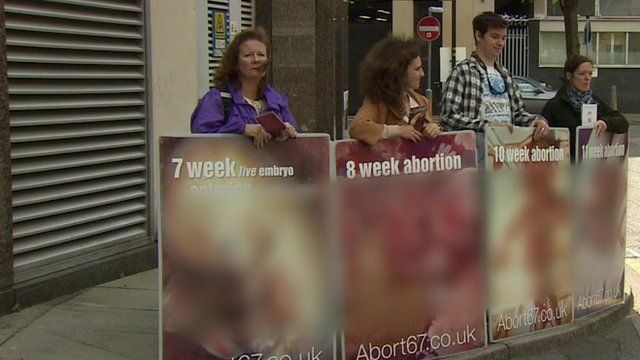 'We believe any abortion is one too many' Jump to media player The BBC speaks to two women who feel strongly about abortion - on either side of the issue. The number of protests by anti-abortion campaigners in the UK appears to be on the rise. Confrontational tactics are increasingly being used outside clinics in Britain by protestors who say they are defending what they call the vulnerable unborn. Reeta Chakrabarti has this special report.